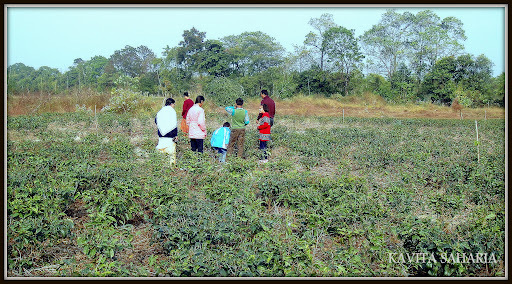 wanted to write a post on one such lush green tea garden with a detailed account on how things work in there BUT my post today is based on a trip to a very small tea garden which is in its initial stage .Small tea growers are also contributing to the develpment of tea industry .My brother-in-law is one such small tea grower. 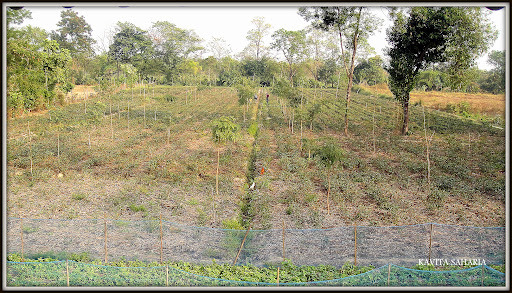 Two years back he bought this tea garden which is situated at Bamonjuli a village around 40km away from our native village.His garden shares the border with the famous Borengajuli Tea Estate.The above picture is of Borengajuli Tea Estate. 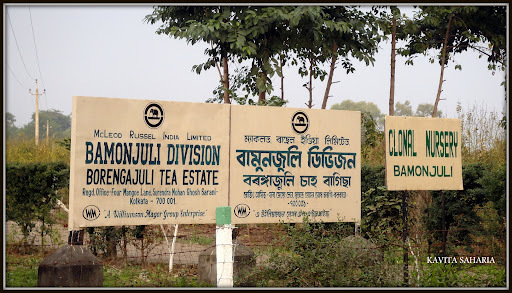 Borengajuli Estate produces the most fabulous graden teas popular all over the world .Read more on it here and here at Culinary Teas . Bamunjuli is about an hour drive away from our village Naamkhola.The road condition is not that good. 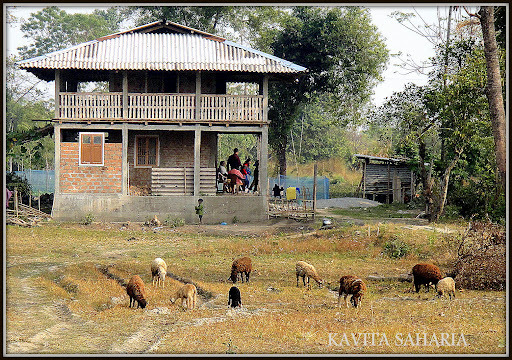 Kanu da made this double storey house as a safety measure because of regular wild elephant visits . It is a very very quite village. Most of the villagers here work in gardens as labourers . 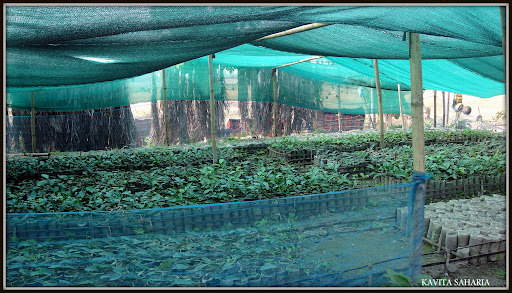 This is Kanu da’s nursery where they grow and store small tea plants.He usually sells the tea leaf to the tea auction centre of the area like all other small tea growers but recently a Canadian delegate visited his garden and showed their interest in buying organic-tea directly from him.The delegate had come to visit mostly small tea growers of Assam.He is also keen on growing green tea and is working on it. This is how a tea flower looks like. 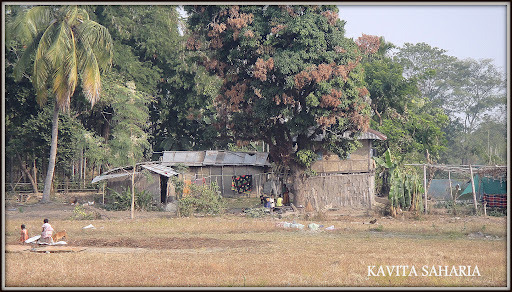 These are the homes of the villagers he bought the garden land from . They are the one who keep an eye on the garden in his absence. An educational tour for the kids by their dear uncle . Kids come up with different stories everytime they see me sipping my tea . This house belongs to a comparatively rich villager . 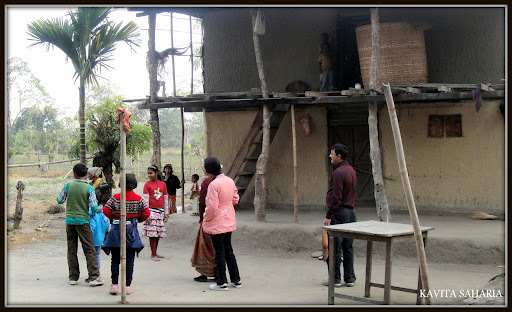 The village has a govt school but most of the kids don’t go there. Kanu da tried to convince the villagers to encourage their kids to go to school but it made no difference. 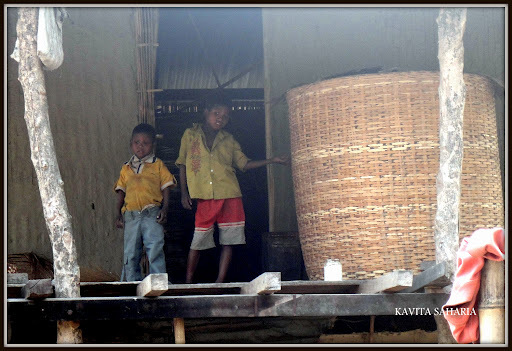 Most of the kids here are sent to the city and nearby towns to work as domestic helps. A view from the house .Watering and taking care of the trees is a tough work . 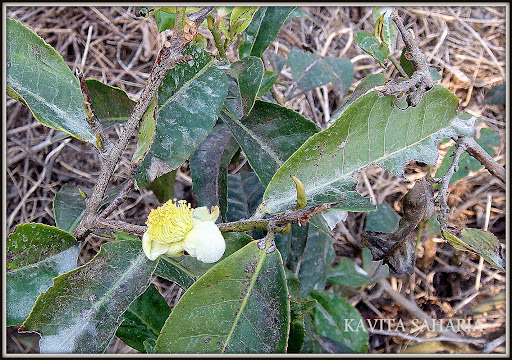 Soon the tea leave plucking season will start and a lot of activity is expected here. Kids had fun running up and down . My son got some tea leaves tucked in his jacket pocket for me knowing how much I love tea. 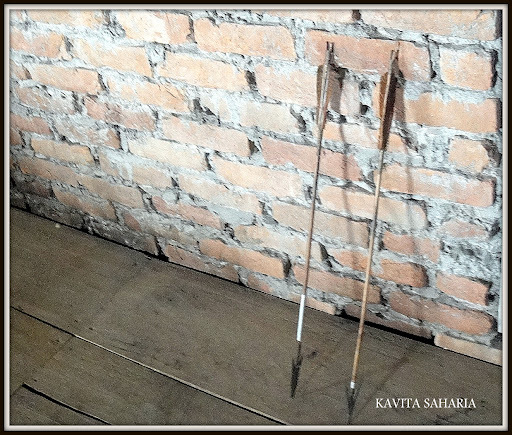 To protect their crops and houses villagers use these arrows to chase away the wild elephants .They put fire on arrow and shoot it into the air when elephants attack.There are many sad stories related to animal poaching but because of legal reasons I can’t share it here. After lunch the group returned to Naamkhola ,had tea and refreshments. Bablu and Puja helped in packing sweets ,home made pithas , curd/yogurt for me and eggs for their cousins. After a tearful farewell they came back to Guwahati. Very interesting, Kavita. This makes one not take our tea for granted. I was very sad to read about the kids not being educated. I think only economic conditions drive people to do that – nothing else. 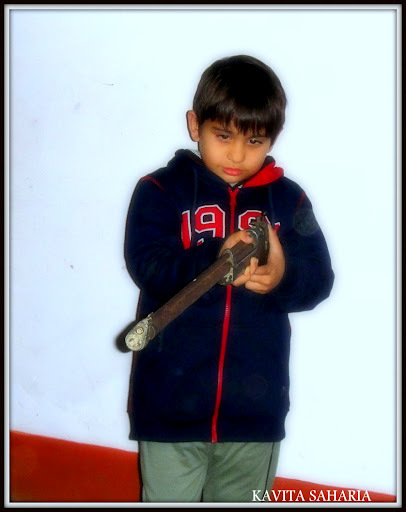 Loved the pictures and the story….I love tea too. Would love to own a place like this. I do exactly the same, mix Darjeeling and Assam tea,tastes wonderful.Thanks Rama. Interesting visit to tea garden with such nice images. Wow! too good! love the place and the aroma of that wonderful place filled with tea leaves…Thanks to ASSAM largest tea grower in the world!We have tea in US coming frm ASSAM there are actually many of them under different name brands from ASSAM…we always feel proud to see our country and its name ..in the grocery section!thanks for sharing kavita…I always enjoy each of your post and think its a blog worth reading to update your knowledge about india and its conditions … the tribal area and variety of food..All in one!Keep up the good work!! :)have a wonderful week ahead! 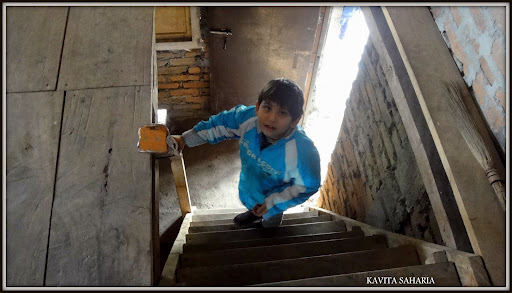 These are such incredible photos, Kavita. I love visiting these wonderful places vicariously through your posts. I've been rather occupied with lots of "stuff" over here and haven't been able to blog visit very much lately. I'm glad I was able to stop by tonight for a "dessert." We drink a lot of tea here too. Haaaaa ! Some other time Saheb !Thanks. Hey Sharmila , I loved your beautiful post on Copenhagen .Thanks for your nice comment. Very informative and interesting! We learn more by traveling and seeing things first hand rather than through books and films. And there is so much that we can learn from rural India. I find it very fascinating! Stunning pictures!!! Well done and presented!